July has seen us working in a number of sectors, including eCommerce, estate agency, vehicle leasing, law and kids entertainment. As always, we are working on a number of projects, some of which recently went live. Take a look below for more information. 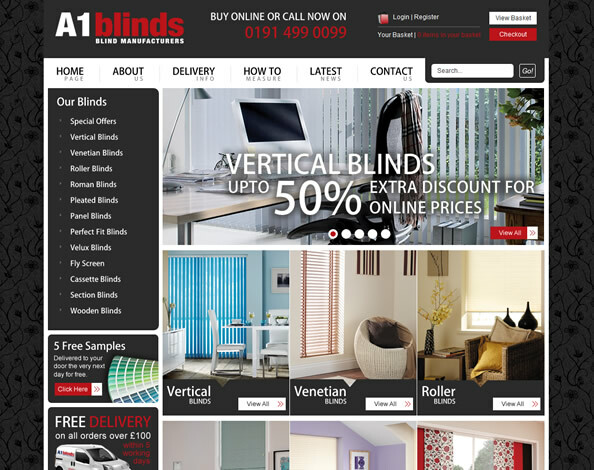 A1 Blinds are one of the largest blinds manufacturers and suppliers in the UK, and came to Union Room needing the company’s first ever eCommerce website. We have been working with A1 Blinds for the last couple of months, adding in some completely bespoke functionality such as the ability to instantly get a quote on a specific size / length of blind. 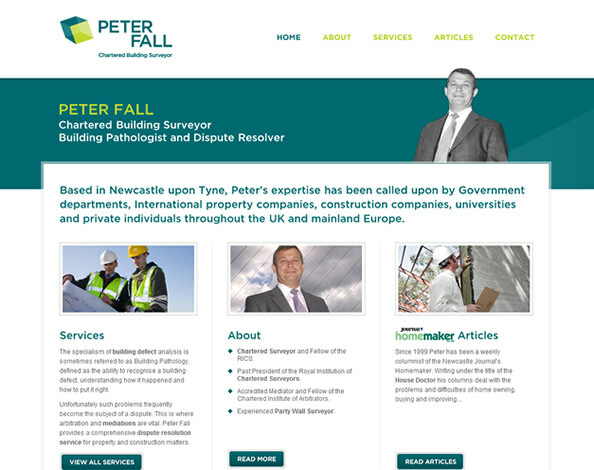 Based in Newcastle, Peter is a past president of the royal institution of chartered surveyors, and current fellow of the RICS. Working alongside Projector (who created the branding), we designed and built his website, working closely with Peter at all times. 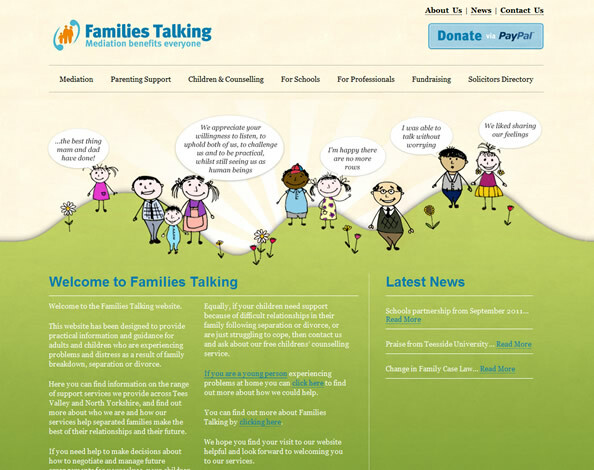 The Families Talking website provides practical information for adults and children, experiencing problems and distress as a result of family breakdown, separation or divorce. The new Sanderson Young website is almost ready to go live. In the last week or so, we have been busy ensuring that the site is feeding the various external websites and apps etc that have been set up in the past. 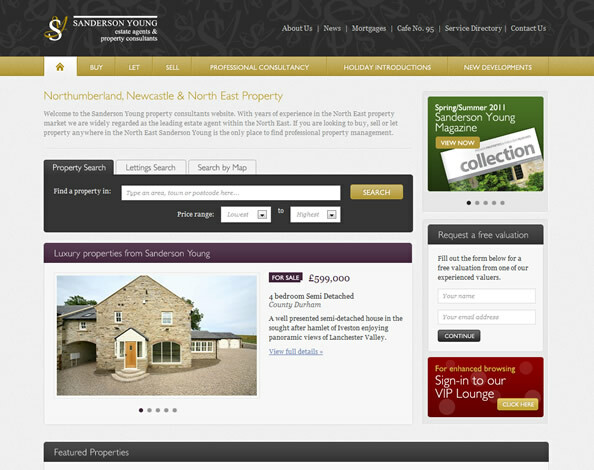 We’re confident that the new website will improve the way Sanderson Young do business online, and will be a big hit with its users. We’ve been mentioning this for a couple of months now, and are on course for a mid-August launch. We still cant say too much about it, but you can read a sneak preview over on Bespoke Radio’s blog. We’ll be publishing a blog post as soon as we can reveal the details on this. We have been working on some great new functionality for the VLS admin panel, which allows their users to access information about fuel usage in certain areas. Bowloom supply and install high-end carpets in the London area, and are working with us to produce a new website that will show off the fantastic and detailed work they do on a daily basis. We are nearing the completion of the new website for Blyth, Gosforth and Morpeth-based Carr & Co solicitors. The full website has been built using WordPress, allowing full control over the content and imagery used throughout each page. We have been working with OSE European on a number of projects, ranging from SEO to website updates. We will be helping OSE expand the website over the coming months, and helping push awareness of their new offices in Belgium. We are almost ready to move to the development stage of the new Bprint website, and we’re excited to help the company stand out in a crowded sector. We are looking to implement some new technology with the site, so it should be a really interesting one when it goes live. SkillsBridge, set up by North East Enterprise Bond (NEEB), is a five-year programme that delivers bespoke, sustainable skills to the voluntary and community sector by tapping into expertise from the private and public sectors. SkillsBridge brings support to organisations by matching up proven experts from the private sector to mentor organisations that would benefit from assistance in the voluntary and community sector. We’re working closely with their team in creating new designs for the charity’s website, as well as supporting with ongoing search engine optimisation. The Newcastle Drum Centre are a long term client of ours, and we have been working with the team on design, development, SEO and email marketing for over 18 months now. In the next couple of months, we will be beginning work on a completely new website, which will be more focused on their target audience. The Startown website is going to be based around two of Parkdean’s kids characters, Sid & Lizzie. We’re very excited for this project, as we rarely get the chance to work on digital media aimed solely at kids. We are in the wireframing stage for the project at the moment, so keep an eye on our dribbble account for any images we release. White Acres is Cornwall’s premier fishing destination, and we’re delighted to be designing their very first bespoke website. We will also be redesigning the popular News Reel blog, making it even easier for regular readers to find the content they’re looking for.